Fr Alejandro Lopez OFM Conv during Palm Sunday commemorations at Our Lady of the Rosary Parish, Kellyville. Image: VisualEyes Photography/Diocese of Parramatta. Parishes all across Western Sydney and the Blue Mountains have celebrated the beginning of Holy Week with Palm Sunday celebrations. At Our Lady of the Rosary Parish, Kellyville, parish priest Fr Alejandro Lopez OFM Conv celebrated Mass for over 500 parishioners at 11am. Before Mass, Fr Alejandro blessed the palms of the congregation before processing around the church grounds with parishioners. Palm Sunday commemorations at Our Lady of the Rosary Parish, Kellyville. Image: VisualEyes Photography/Diocese of Parramatta. During his homily, Fr Alejandro said Palm Sunday allows us to renew our commitment to follow Christ. “Jesus rides into Jerusalem like just such a servant leader. Coming to claim God’s city, to claim God’s world, by serving through sacrificial love!” Fr Alejando said. “Yet if some refuse to acknowledge his reign, then even the very stones must shout his praise! And this is Good News for us. “For if lifeless stones can cry out the wondrous deeds of God, what might God do with our stony hearts? “Today, we renew our commitment to follow Him! Through Passion and Death even! Not just with palms that will wither and finally turn to ash, but also with resurrected hearts, afire with love! And with lives meant for eternity, renewed by the wonders of our loving God and King,” Fr Alejando said. Fr Alejandro Lopez OFM Conv speaks during Palm Sunday commemorations at Our Lady of the Rosary Parish, Kellyville. Image: VisualEyes Photography/Diocese of Parramatta. Elsewhere, Bishop Vincent OFM Conv celebrated Palm Sunday with hundreds of young people, school students and families in a procession through the Parramatta CBD and celebrated Mass at St Patrick’s Cathedral, Parramatta. 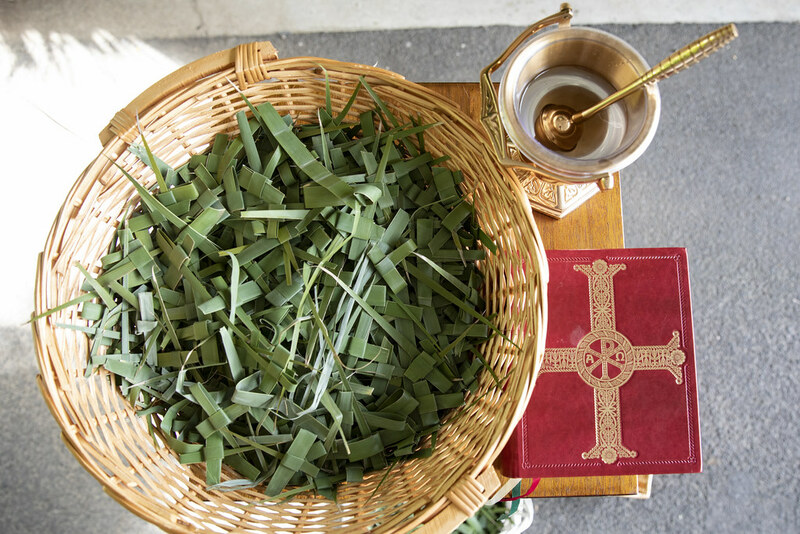 View images from Kellyville Parish’s Palm Sunday celebrations here or below.